Flowers and wreaths adorn a naval anchor honoring President George H.W. Bush on a bluff overlooking Walker's Point in Kennebunkport on Saturday, Dec. 1, 2018. In this Nov. 5, 2017, file photo, former president George H.W. Bush arrives for an NFL football game between the Houston Texans and the Indianapolis Colts in Houston. In this May 3, 2006 photo, former President George H.W. Bush embraces former first lady Barbara Bush after she introduced him at the Genesis Women's Shelter Mother's Day Luncheon in Dallas. 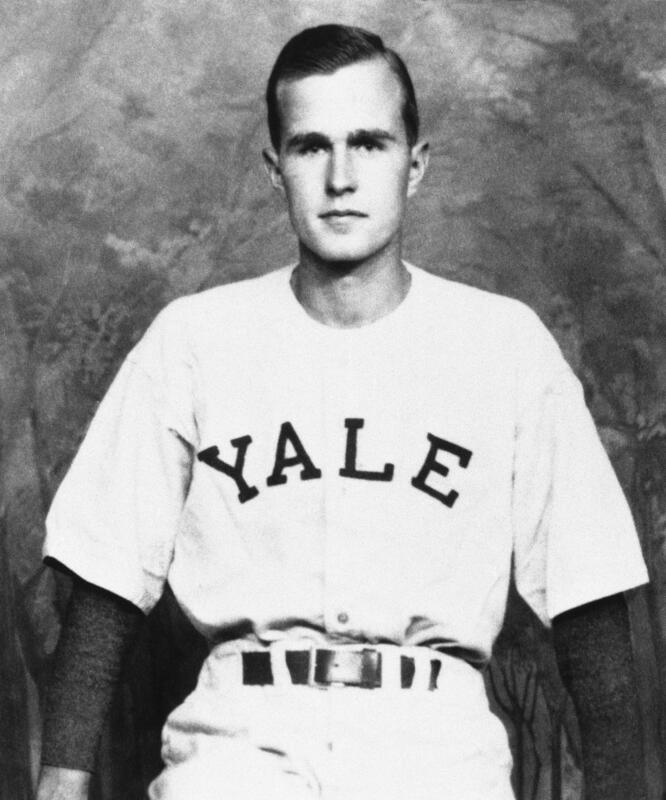 George Bush is shown as captain of the Yale baseball team, 1947. 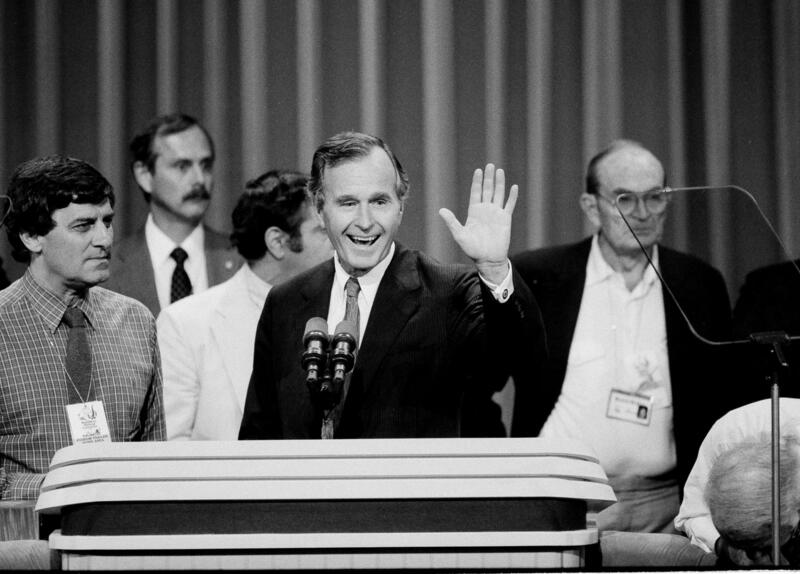 Vice President George Bush waves from the podium of the Dallas Convention Center in Dallas, Tex., as he checks it out prior to the start of the final session of the Republican National Convention, Aug. 23, 1984, in Dallas, Texas. 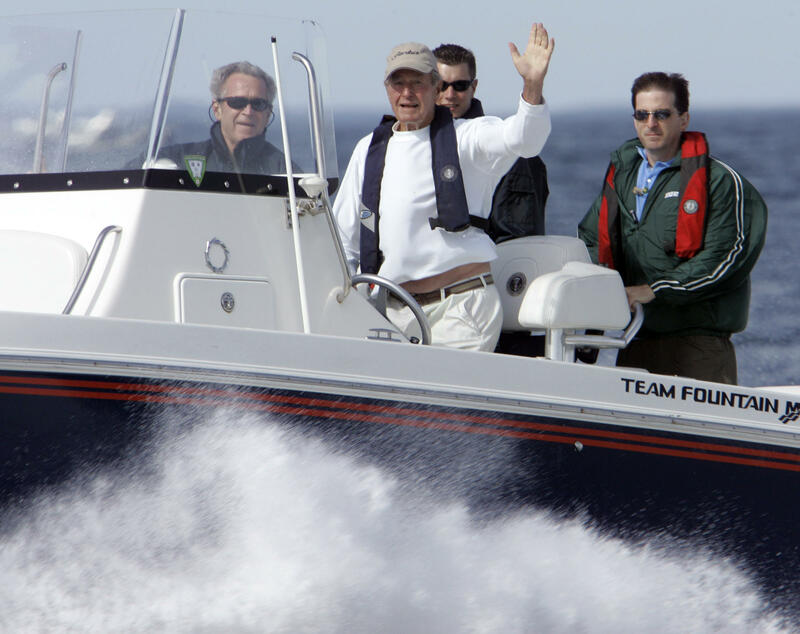 President Bush, front left, rides with his father, former President George H. W. Bush waving from his speedboat, Fidelity III, as they head back to Walker's Point after fishing Thursday, Aug. 9, 2007, off Kennebunkport, Maine. 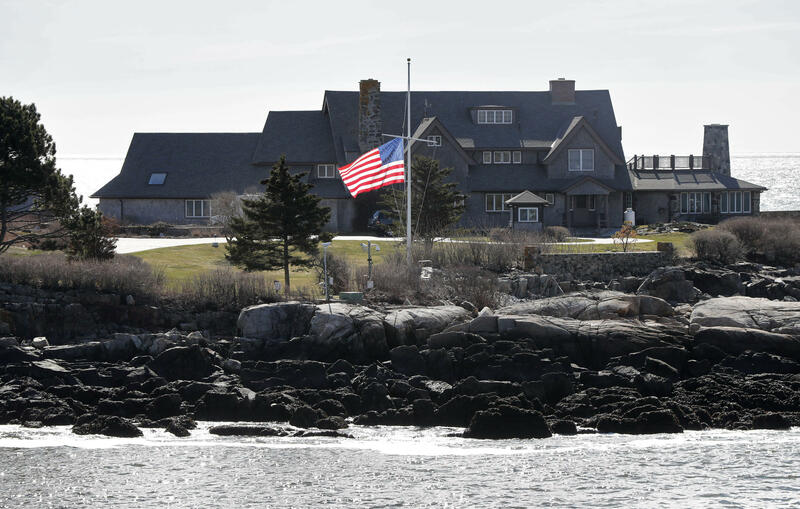 A U.S. flag flies at half-staff at Walker's Point, the summer home of the President George H. W. Bush and former first lady Barbara Bush, Wednesday, April 18, 2018, in Kennebunkport, Maine. George Herbert Walker Bush died late Friday. For many in the community surrounding Walker's Point in Kennebunkport, Maine, the former president was much more than the leader of the free world — he was their beloved friend and neighbor. No matter where in the globe former President Bush's pursuits took him, he circled back every year, as if tethered, to Walker's Point — the estate his ancestors established more than a century ago on a windy promontory off Kennebunkport. "It's where my family comes home, and it's our anchor to windward," he said. "It has great meaning in terms of family and we are blessed. The Bush family is blessed." President George W. Bush (left) rides with his father, former President George H. W. Bush waving from his speedboat, Fidelity III, as they head back to Walker's Point after fishing Thursday, Aug. 9, 2007, off Kennebunkport, Maine. He visited the point every summer of his life, with one exception: 1944, when he was a Navy pilot. He mentioned its importance to him most every time he spoke publicly during his annual sojourns to what became known as the Summer White House. "This is a place where we really enjoy ourselves, but more than that, kind of refurbish our souls, get our batteries all charged up and enjoy life really to the fullest. It's a point of view. You can feel it, in the land and in the water here," he said in 1989, a year after he was elected president. Although matters of state would impinge on his leisure during his presidency, Bush had two constant goals when in Maine — golf and fishing. "He was always the captain, no matter we were on his boat, my boat or we were just sitting there having lunch. He was still captain," said Bill Busch, no relation, the president's longtime fishing companion. Busch and the president plied the coast from Scarborough to Ogunquit in search of striped bass, with peanut butter and jelly sandwiches in the hold. Usually they would throw the stripers back, when they caught any. Back in 1989, the Portland Press Herald's front page kept a running tally of the number of days Bush suffered a fishing drought. "I'm not going to comment on the fishing," Bush said at the time. "A vicious, vicious assault on my ability." While national media tagged Bush for an off-putting patrician manner, Busch said the president's collegial nature transcended any sense of class or rank. "He was the leader of the CIA, and he was a fighter pilot that got shot down. You kind of forget all these things because he disarms you with his good will and just his demeanor and his caring about other people. He makes you feel so comfortable. I just didn't expect to ever see something like that," he said. That assessment is seconded by many of his friends and acquaintances from Maine. But he was more than just a congenial local who happened to be famous — he and his wife Barbara, who died in April, were also kind of brand ambassadors for the town. "We all talk about branding and we're all scrambling to do that as communities. They did that decades ago," said Laura Dolce, president of the area chamber of commerce. Dolce said the Bushes goosed the local economy while putting the town on the world map, thanks in part to the coterie of cabinet members, dignitaries, Secret Service members and journalists that would pass through in summer. "Of course eating and drinking and doing all of that," she said. "But while doing that they're broadcasting to the world. And they have for decades, and the world decides they really want to see where this place is and that has continued, gosh, through 34 years. I literally just helped a couple who were on their way up to Boothbay Harbor but stopped here in the state because they had to see where President Bush lives in the summer, and that is our No. 1 request to this day." The Bushes were known for quiet local philanthropy as well. While Barbara Bush lent her name to Maine Medical Center's children's hospital in Portland, they also endowed an educational fund for the Kennebunkport Conservation Trust. And townspeople gave back, working with the trust to establish a public garden with statuary commemorating Mrs. Bush and, up on a bluff overlooking Walker's Point, a naval anchor honoring the president. They surprised the president with that gift about a decade ago. The president's golfing buffy Ken Raynor emceed the event, and he recalled the president's gracious thanks. "He also spoke from the heart, which meant a lot. And then in true fashion, as Bar expected him to do, he invited everyone back to Walker's Point afterwards, particularly for those people who'd never been to Walker's Point before. And that was his way of saying thank you for this," he said. Bush might have felt slightly less thankful the year the local board of appraisers bumped the assessment on Walker's Point above $2 million. But when a gaggle of reporters quizzed him about it at the Cape Arundel Golf Club, President Bush took a philosophical approach. "Let them put the taxes wherever they want and I'll pay them in this case. Might have a different attitude if it weren't Kennebunkport and Walker's Point," he said. Soon after that, he headed back to the links. "Full credit, full credit on the press conference," he said, driving off in the golf cart. Assistance with the archival audio in this story was provided by the George H. W. Bush Presidential Library and Museum. 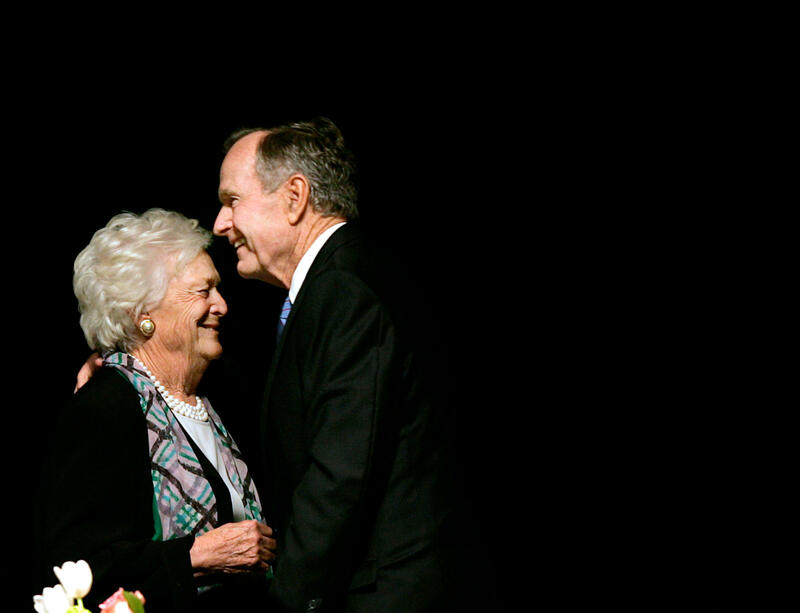 Barbara Bush made an indelible mark on the state of Maine, through her generous philanthropy – and the force of her personality. Her death yesterday at 92 is a deeply-felt loss for Kennebunkport, the family's summer home.